My lips have needed a little help lately. They’ve been chapped, sore, and are peeling and flaking like crazy (odd for the warm summer months). As I usually wear lipstick any chance I get, I need to make sure the lipstick goes on smooth and doesn’t cake and crumble. So a little prep and prime is in order. Step 1: Exfoliate – There are a lot of great lip scrubs and buffers on the market, as well as some great DIY scrubs online. But I love the C.O.Bigelow Apothecaries Mentha Lip Buffer, a mint infused lip exfoliator with peppermint oil, shea butter and cocoa butter. You just need a tiny amount to rub between your lips, you can even use your fingers. Then just remove with a tissue or washcloth. Don’t want to purchase a buffer or exfoliator? Simply use a soft toothbrush and gently massage in circles on your lips. The bristle will work just like a sugar scrub to gently remove dead skin and leave your lips smooth. Step 2: Condition – I don’t usually condition my lips right before I apply lipstick, but I sure do condition them often when my lips are bare. I have to make sure I’m doing what I can to keep them soft and smooth….am I right? I’m sure you’ve all heard me talk about the Blistex Daily Conditioning Treatment before. I’ve yet to find something that I love as much as this. If only it was in stick form so I don’t have to stick my finger in the pot (I use Qtips as applicators often). Step 3: Prime – Before the lipstick application, you have to prime the lips. I’ve only started doing this recently and I can’t believe that I’ve been missing this step this whole time. I use my recently purchased Sephora Universal Lip Liner which lines the lips to prevent feathering and primes the lips all over for a smooth application and a perfect finish!! The primer makes the lipstick stick to the lips much better than without. It’s also waterproof, so no need for reapplication. And there you have it! Your lips are prepped and primed and it’s time to apply your fav lipstick!! 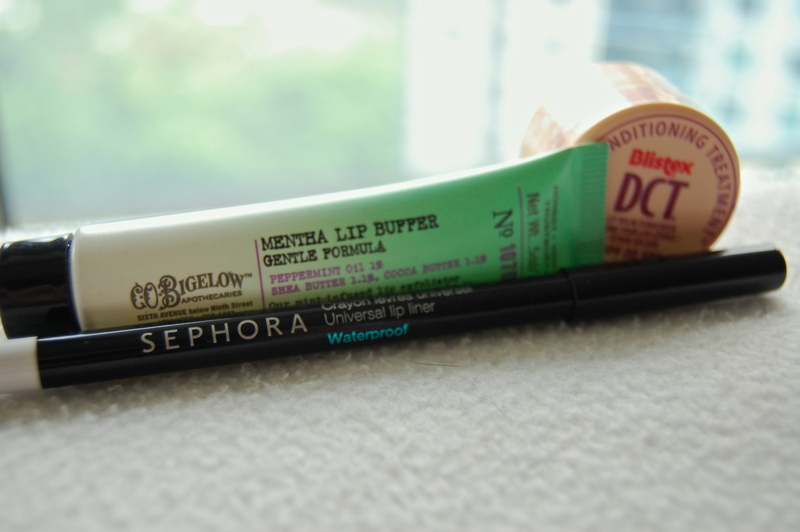 Do you have a favourite lip prep or prime product?